A few years ago, fuel injected motorcycles were rare. Fitting an aftermarket exhaust system to your machine typically involved a corresponding adjustment to your carburetor (or carburetors) to compensate for the increased flow over the stock system. If you installed an aftermarket air filter featuring higher flow at the same time, your stock carburetor settings were left even further off the mark. Rejetting a carburetor is a bit of a black art. It is not something you want to try from scratch, without the benefit of knowledge gained by an expert matching your aftermarket air filter and exhaust system to the correct carburetor jetting on a dynamometer. As a result, “jet kits” are offered by the aftermarket for various motorcycles, principally by Dynojet and Factory. Well, things have turned on their head a bit. Fuel injected motorcycles (particularly, among sportbikes) are rapidly becoming more common than carbureted bikes. Not surprisingly, a similar problem arises when you take your fuel injected motorcycle and exchange its exhaust system (and/or air filter) with an aftermarket unit. Increased flow results (along with increased noise, typically), and your stock fuel injection settings do not work properly. Jet kits don’t help, because fuel injection systems don’t use carburetor jets — they use computers and, more specifically, fuel injection “maps” to adjust the fuel/air mixture to optimize performance. Once again, the aftermarket has come to the rescue with hardware and software to optimize these fuel injection maps. We could call them “map kits”, but we won’t. Recently, we had a chance to sample Yoshimura’s race slip-on exhaust system (with the Tri Oval shape), which breathes much better than the stock system on our 2002 Honda CBR600F4i. 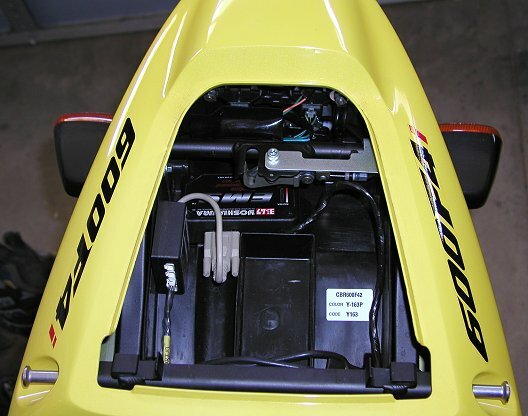 We also installed Yoshimura’s new EMS (“Engine Management System”) hardware and software to adjust the fuel injection map from the stock Honda settings to settings developed by Yoshimura on its dyno specifically for our California model F4i. Why did Yoshimura enter the aftermarket business developing an engine management system? We didn’t ask anyone at Yoshimura this specific question, but the answer seems fairly obvious. Yoshimura has had great success racing Suzukis here in the United States for many years (Mat Mladin is the three-time defending AMA Superbike champion aboard his Yoshimura Suzuki GSX-R750). Suzuki’s GSX-R750s have been fuel injected for a relatively long time (is seven years correct? ), and Yoshimura has developed great expertise in working with fuel injection and engine management systems that control fuel injection, ignition timing and other functions. After our Tri Oval exhaust system was installed (it fit perfectly, by the way), we had the EMS system installed under the passenger seat of the F4i (see picture at right). The system takes up little space and doesn’t weigh much, but does an awful lot (particularly, with the accessory hub installed on our bike). In addition to offering the ability to change the fuel injection map on various production machines, the EMS system also has the ability to re-map your ignition timing (remember the art of advancing the ignition timing on your carbureted bike? — this can now be handled with computer software on some of the current sport bikes). With the optional accessory hub, Yoshimura’s EMS offers several other possibilities to the adventerous motorcycle owner, such as a gear shift pedal actuated engine kill switch that cuts the fuel for a user-selected amount of time, allowing easier clutchless upshifts, a shift light (high intensity LED unit available from Yoshimura) that comes on at a user-selectable rpm level, and even customization of fuel and ignition timing maps for each individual gear. Our bike was set up with the basic EMS system, the accessory hub and a toggle switch that allowed us to change our fuel injection maps to one of three settings (optimal, 5% richer and 5% leaner). The primary map loaded into our system was a map designed by Yoshimura for a California model F4i utilizing its race slip-on system. Take a look at the dyno charts that show the results of the slip-on system (with and without fuel injection map changes) versus a totally stock system (you will need Adobe Acrobat Reader 4.0 or higher to view these charts). Take particular note of the separate dyno chart representing performance gains at part throttle (60%). This latter chart is very important, because it illustrates how carefully Yoshimura develops their maps to provide increased performance at all throttle positions, not just at full throttle. We have been very impressed with the Yoshimura system (slip-on and EMS) installed on our F4i. Throttle response is substantially crisper, and power seems improved even beyond what is reflected in the dyno charts. Yoshimura’s maps are easily downloadable from a CD or the internet, and tech support is readily available when you purchase any Yoshimura product. If you have a fuel injected sportbike, chances are Yoshimura has a carefully developed map to help you exploit the full potential of your exhaust system. Take a look at Yoshimura’s web site for details and pricing. 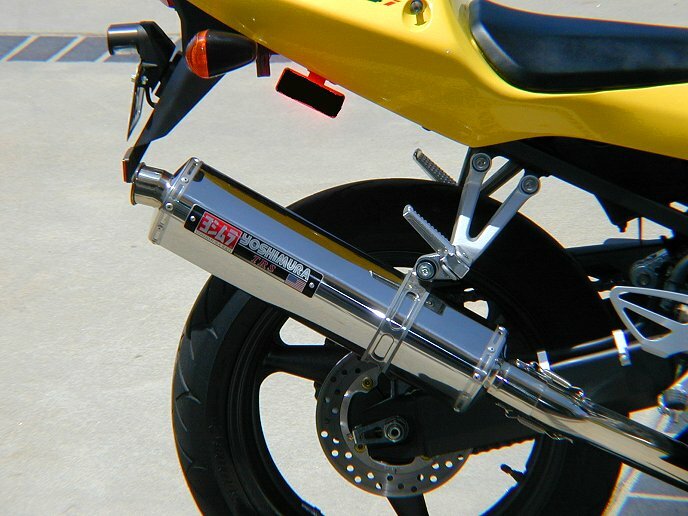 By the way, the slip-on system is 7 pounds lighter than the stock Honda slip-on, and the sound level, although higher than stock, is very reasonable for an aftermarket muffler system.